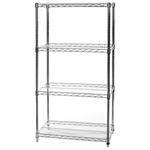 All Poly-Z-Brite wire shelving is guaranteed to resist rust and corrosion for ten years. This shelving is coated with an epoxy finish layered over zinc-chromate electroplating, which makes it possible for it to resist rusting even in the most humid environments. Select your desired depth and height below to see a complete list of shelving length options.